In the wake of the 2012 "end of the world" Mayan Calendar hysteria came a genuine and healthy renewed interest in calendars. Why do we use our current calendar, with its uneven months and odd leap year squeezed into February? Now, exclusively from Abbott ePublishing, comes a book offering creative new changes that would revolutionize how we mark time. Forever. Calendar Reformers are inspiring a new look at our Western calendar, which, after nearly 500 years, is outdated, confusing and seemingly out-of-sync with the way we live today. 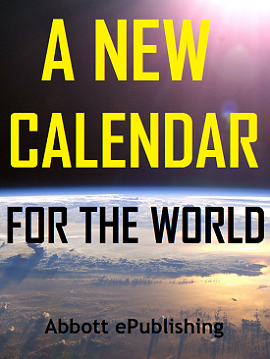 This eBook will inspire you with the tenacity and genius of would-be calendar reformers and their often brilliant ideas. You'll read why past calendar reform attempts have failed, including those by the French and Russians, and you'll learn how the history of calendar reform has been fraught with frustration as well as great inspiration. PLUS, you'll explore MANY incredibly creative, experimental "out-of-the-box" calendar reform proposals like the Metric Calendar, the Pentacontad Calendar practiced by the ancient Mesopotamians in the 3rd Millennium BCE, the 17-Month "Tree" Calendar, and the Fortnight Calendar. These ALONE will inspire hours of creative discussion! This EXTRAORDINARY eBook is offered in Adobe PDF format (which is readable with all eReaders and tablets and, with an Android Adobe app, on most Smartphones) for the low, low price of just $1.99! !